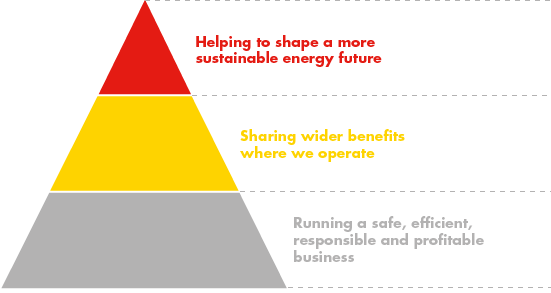 We integrate our approach to sustainability across our activities on three levels (see diagram). We work in collaboration with businesses, governments and civil society, including non-governmental organisations (NGOs), at each level. This is the foundation of our approach, which includes having processes and tools in place to manage safety, environment and community involvement. We aim to continuously improve the way we operate to prevent incidents and identify, avoid where possible and minimise adverse environmental and social impacts across our projects and facilities. In the coming decades, more and cleaner energy will be needed for economic development in the face of growing environmental pressures. We are investing in low-carbon energy solutions and advanced technologies, such as those that increase energy efficiency and reduce emissions (see “Technology and innovation”). The scale of the global challenges that the world faces is too great for one company, or one sector, to resolve. Effective collaboration is urgently needed to shape a sustainable energy future.